Welcome to Learning To Live A Blissful Life: Being Your Best You, Living Your Best Life! I am a lover of life, of people, of being. I believe we are fortunate to have this opportunity to be on earth and that is is not to be wasted. We must learn, extract what resonates with us and then share our interpretations & experiences of life with others so that they can do the same. Resource 2: Measuring Your Emotions Template Exercise – What emotions dominate your day? How do they affect your behaviour and experience of life? Resource 3: Gratitude Journal – A place to collect your reasons to be thankful each day. Save the template and print off each week. Resource 4: Daily Intentions Journal – An exercise in recording your wins and losses, your big goal(s) reminder, facing your fears and forgiving self and others. Resource 5: Negative Self Talk Exercise – Who Are You Talking To Like That? – An exercise to help you notice the ‘stories’ you tell yourself, the truth or lack of truth in them and managing them through more positive language. Resource 6: LoveYourLifePlanner – As you move towards the end of each year, it is a good idea to reflect on it and identify what went well, what didn’t happen at all and what’s important to you for the year ahead. This life planner will help you do just that! Resource 8: Think-and-grow-rich-napoleon-hill – One of the classic personal development books providing steps to creating the life you desire. 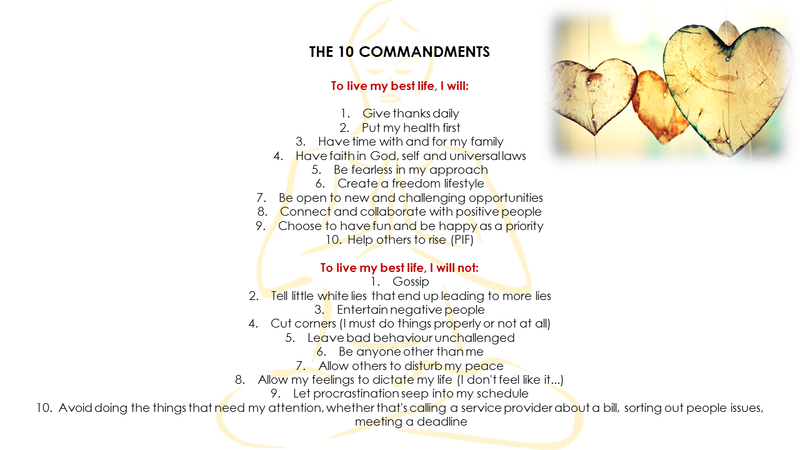 Resource 11: The 10 Commandments [but not as you know them] – This one-pager holds the 10 do’s and don’ts for living your best life. Love it and print it or create one of your own! Resource 12: FREE Online Courses – Love personal development? Then jump over to our online academy, Women Rocking Confidence, and sign up for one of our free courses… And enjoy! Resource 13: Self-Development Videos – Top up your motivation & inspiration on the YvonneB YouTube channel. Whether you’re looking for personal development tips, business tips or some uplifting mindset resources, subscribe here! Resource 14: 6 Ways To Get Out Of Your Own Way – Sometimes you can be your own worst enemy. You talk down to yourself, you limit yourself, you feed yourself poor beliefs. In this short E-book, we cover 6 ways to get out of your own way! Resource 15: 50 And Fabulous – Age ain’t nothing but a number! If you’re nearing 50 or if you’ve already arrived or surpassed it, this little E-book focuses on what you can do to remain fabulous because no matter your age, you are (and you need to acknowledge it)! Resource 16: 5 Things To Keep Your Mind In A Positive Place – Some days are hard, some days push you to the edge and on those days it is difficult to think straight. In this little E-book, you can find 5 ways to help you gain/regain a positive outlook in good times and bad.